Check fraud scams continue to cheat consumers out of thousands of dollars, and complaints to government agencies and consumer advocacy groups have doubled over the last three years, the Better Business Bureau said in a new report released today. Check fraud scams continue to cheat consumers out of thousands of dollars, and complaints to government agencies and consumer advocacy groups have doubled over the last three years, the Better Business Bureau said in a new report released today. These scams can take many forms including mystery shopper scams, check overpayment scams and nanny or caregiver scams. Fake check scams often involve a scammer sending a bad check to a victim and then asking for some of the funds to be returned. After the money is sent back, the scammer’s original check bounces, and the victim is then liable for repaying the lost funds to the bank. The report noted that young people age 20 to 29 are particularly vulnerable to these scams; this cohort accounted for 21 percent of check fraud victims across all age groups. 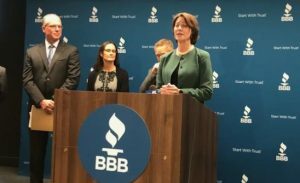 American Bankers Association SVP Nessa Feddis (pictured) represented ABA at a BBB press conference in Chicago, where the report was unveiled today. Other participants in the press conference included Illinois Attorney General Lisa Madigan. The ABA Foundation and the Federal Trade Commission yesterday released an infographic that banks can use to help consumers recognize and prevent check fraud scams.